Stochastic textures yield images representing density variations of differing degrees of spatial disorder, ranging from mixtures of Poisson point processes to macrostructures of distributed finite objects. They arise in areas such as signal processing, molecular biology, cosmology, agricultural spatial distributions, oceanography, meteorology, tomography, radiography and medicine. 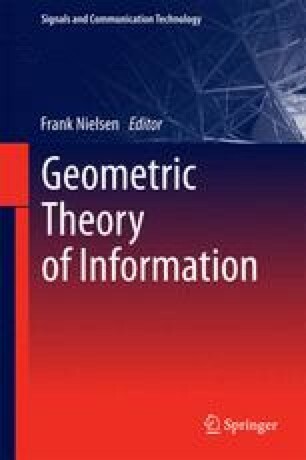 The new contribution here is to couple information geometry with multidimensional scaling, also called dimensionality reduction, to identify small numbers of prominent features concerning density fluctuation and clustering in stochastic texture images, for classification of groupings in large datasets. Familiar examples of materials with such textures in one dimension are cotton yarns, audio noise and genomes, and in two dimensions paper and nonwoven fibre networks for which radiographic images are used to assess local variability and intensity of fibre clustering. Information geometry of trivariate Gaussian spatial distributions of mean pixel density with the mean densities of its first and second neighbours illustrate features related to sizes and density of clusters in stochastic texture images. We derive also analytic results for the case of stochastic textures arising from Poisson processes of line segments on a line and rectangles in a plane. Comparing human and yeast genomes, we use 12-variate spatial covariances to capture possible differences relating to secondary structure. For each of our types of stochastic textures: analytic, simulated, and experimental, we obtain dimensionality reduction and hence 3D embeddings of sets of samples to illustrate the various features that are revealed, such as mean density, size and shape of distributed objects, and clustering effects.